I hope you are all doing great!!! It has been a while since my last post, I almost forgot how to log in hehehe. I have still been doing my nails at least once a week, sometimes longer. I think I have actually improved my skills and lately I have been trying more nail art and I'm very happy with the results. Can't wait to show you guys. Well I will be posting some of my latest manis very soon. 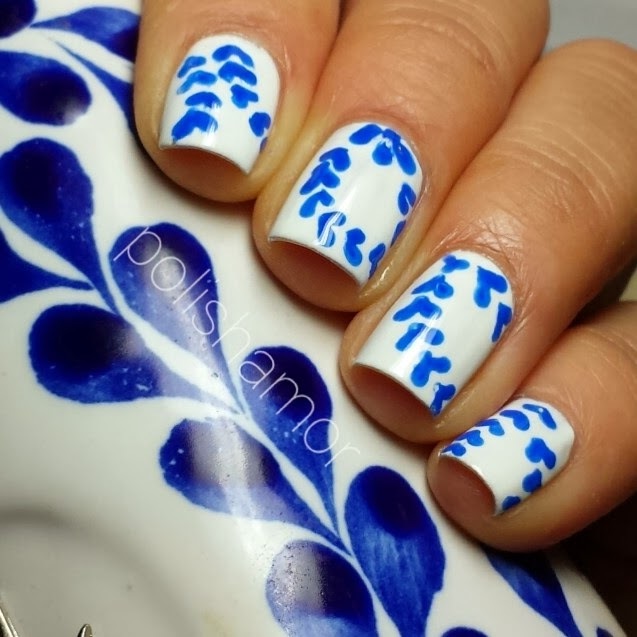 I will leave you with what I have on my nails right now :) This was inspired by a tequila bottle pattern. It is so nice to see you back, and this mani is sooo beautiful! Really pretty Iris!! It's so sweet to hear about how your son is helping out ;0). You know I missed your posts AND you. Welcome back!! Great to read you again Iris! OMG, I thought you would NEVER post! I don't think I've seen a post from you since I started following you on IG! Welcome back! I've missed you, congrats on the new addition! i LOVE this mani, very delicate and pretty!